Autism Fundraiser Party Ideas, Plus a Free Autism Party Printable! Autism Spectrum Disorders (ASD's) are developmental disabilities, for which the "umbrella" term is widely recognised as Autism. While Autism is becoming better understood, the cause is still unknown, and there is currently no cure. Further research and community awareness is very much needed to help families affected by this disorder. You can fundraise for your local Autism charity organisation, or help to fund further research programs. By doing so, you will also help to raise awareness in your local community. There are many options and benefits for donating. You could raise enough funds for an ASD child to receive an assistance dog, or for a family to go on a holiday, that they would otherwise go without. You could fund a support group for a year, or an iPad for a needy child. April 2nd is World Autism Day, and April is Autism Awareness Month. Why not invite all of your family and friends to a fundraising party? April is almost here, so you may want to get your fundraiser plans underway. To help with that, we've got some inspiration for you, created some new products and you can sample these with a FREE download! Let's get started! 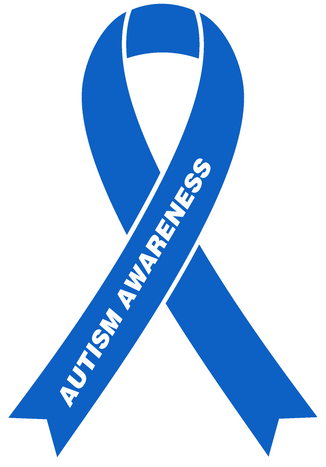 Blue is the colour that is commonly used to represent autism. 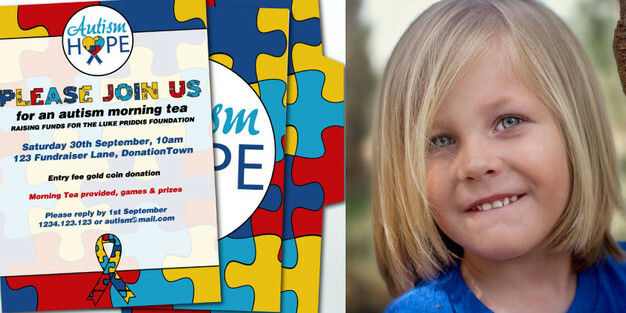 The Go Blue for Autism campaign is a very quick and easy way for the community to get involved. You could simply hold a "blue" event! 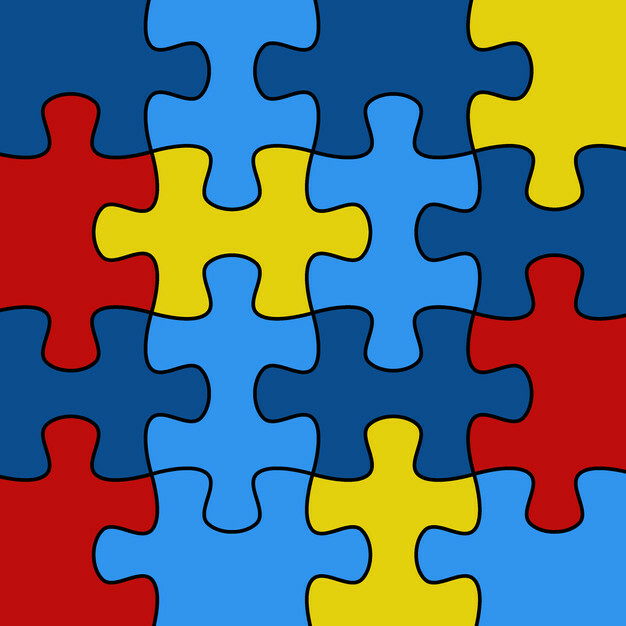 The autism symbol is widely recognised as the jigsaw puzzle piece. You may opt to use that as a basis for your fundraiser theme. Common colours used are dark blue, bright blue, yellow and red, as shown below. However, you are not limited to this colour scheme - your guests will love your creativity if you prefer to do it all your own way! Make your party decorations an easy job with Party Printables by The Digi Dame Party Shoppe. 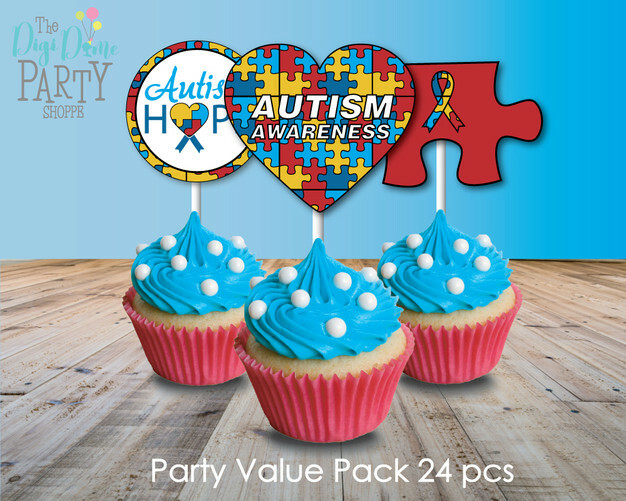 On our Online Shop we have listed some items for an Autism Fundraiser Party - a Party Printable Pack that includes an editable invitation (shown in image above) for only $20AUD. These are available for purchase now, so you can get your party started right away! Many Autism charities offer or sell merchandise to raise funds. Merchandise at your event is a quick and easy way to raise funds - people love the fact that they can donate to charity whilst still receiving something unique for their money. 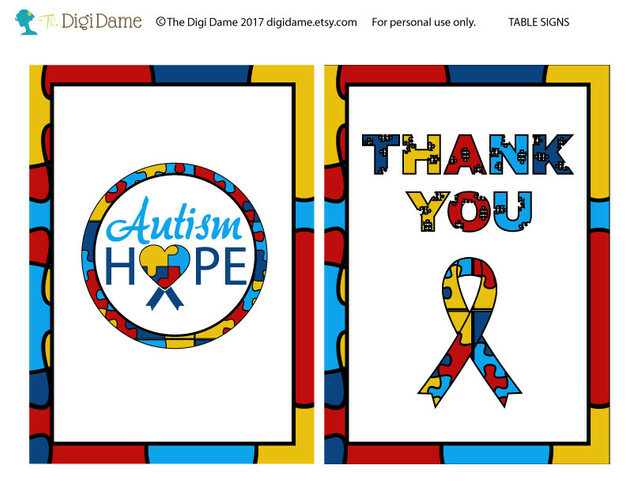 Your FREE download to get you started is a pair of Printable Table Signs, which are great for decorating your fundraiser or giving to guests as thank you cards. They are 5x7in in size, in PDF format. Click here to download! 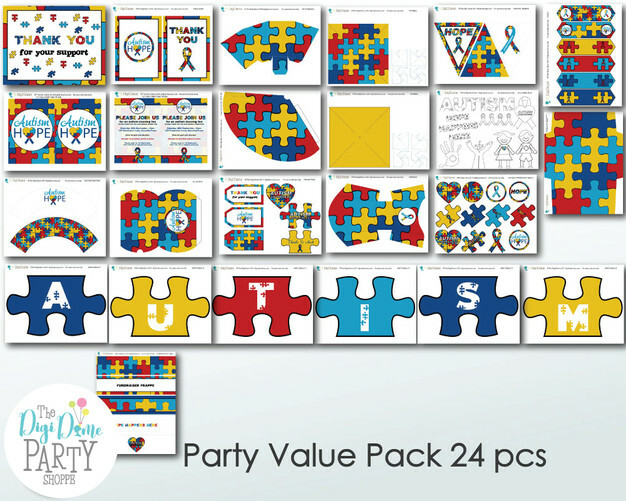 This free download is part of our Autism Party Pack that includes the matching Party Invitation, mentioned above. Simply open in Adobe Acrobat Reader, then print at home on plain white paper or card stock. Enjoy, and Happy Fundraising! Kind Regards and Happy Fundraising! Need more ideas for hosting an autism-friendly party? Read this post.